Has anyone installed this? I just got mine in the mail and the only instructions are the wiring diagram. I'm not the best with wiring diagrams and was hoping someone could help me understand it a little more. The model I have is FLRSCH5, the seller flashed it to my vehicle before they sent it and he said my car requires the Type 3 install and that I need to cut and or splice a few wires but I'm not really seeing where? I see where it says to cut and isolate the white/yellow wire on VS2, but I'm not sure where the Purple - Starter (+) Output and the White/Yellow - Control (MUX) Output wires go??? I'm looking at purchasing and installing this myself too with the same pin-out/wiring guide onto a 2006 300c 5.7, im an electrical engineer so once mine arrives (having to import from the US to the UK) I will be better able to help Unless of course you have already figured this out? Wow, I thought this was plug and play system. I got one and the dealer is putting mine in while I've got the car their for a few other things but I'm going to ask him exactly where it goes. If that fails there is someone else here in Canberra that installed his himself so I'll be able to catch up with him to find, cause he already said he'd help me put it in but cause the car is at the dealers i didnt worry. Yeah I had finally figured it out. The purple and yellow wire tap in to two wires on the back of the ignition harness. I just used some T-taps to do it, the rest was plug and play. I removed this because I thought it was causing an issue with my tpms system which all goes through wireless control module. Come find out I just think I have aftermarket TPMS sensors that aren't compatible so I'm to reinstall the remote start. Wonder if the next gen models install the same way. 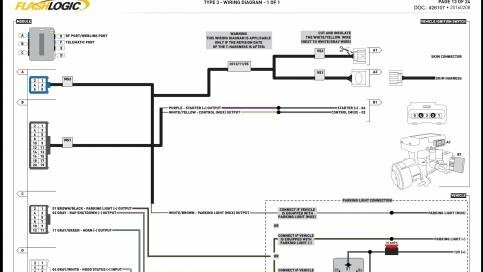 Just follow the directions in TYPE 3 - WIRING DIAGRAM - 1 OF 1!!! There are 2 (TWO) connectors that plug into the backside of the ignition switch. There is a LARGER 5 pin connector and a SMALLER 8 pin connector. Splice the PURPLE wire from the FLASHLOGIC T-HARNESS into the wire coming out of POSITION 4 OF THE LARGER 5 PIN CONNECTOR. Splice the WHITE/YELLOW wire (WHITE WIRE WITH YELLOW STRIPE) from the FLASHLOGIC T-HARNESS into the wire coming out of the POSITION 2 OF THE LARGER 5 PIN CONNECTOR. CUT AND INSULATE THE WHITE/YELLOW WIRE (NEXT TO WHITE/GRAY WIRE). If I remember correctly, you splice the WHITE/BROWN wire from the FLASHLOGIC T-HARNESS into the WHITE/BROWN wire coming out of the back of the HEADLIGHT SWITCH. MAKE SURE TO REMOVE THE HEADLIGHT SWITCH CORRECTLY. There is a YouTube video ("2005 Chrysler 300 touring headlight switch replacement") that shows you how to remove the headlight switch. If you are having issues disconnecting the wire connectors from the ignition switch, take it out of the dash and you will have more room. DO NOT, I REPEAT, DO NOT GET AGGRESSIVE WITH ANY OF THE WIRING CONNECTORS MENTIONED ABOVE, ESPECIALLY THE SMALLER 8 PIN CONNECTOR!!! I HAVE LARGE HANDS WITH BIG FINGERS. I USED NEEDLE NOSE PLIERS TO PUSH DOWN ON THE RELEASE TABS ON THE 8 PIN CONNECTORS AND ENDED UP CRUSHING BOTH THE FACTORY AND T-HARNESS 8 PIN CONNECTORS!!! HAD TO BUY ANOTHER T-HARNESS FROM FLASH LOGIC AND 8 PIN CONNECTOR FROM CHRYSLER!!! IF YOU NEED TO DISCONNECT ANY OF THE 8 PIN CONNECTORS, PRESS DOWN GENTLY ON THE RELEASE TAB, TAKE A VERY SMALL FLAT HEAD SCREW DRIVER AND WEDGE IT CAREFULLY BETWEEN THE PLACE WHERE THE MALE AND FEMALE 8 PIN CONNECORS COME TOGETHER. DO THIS ON EACH SIDE OF THE RELEASE TAB. YOU JUST NEED TO "BARELY START" THE DISCONNECTION OF THE MALE AND FEMALE CONNECTORS WITH THE SMALL FLAT HEAD SCREW DRIVER ON EACH SIDE OF THE RELEASE TAB AND THEY WILL SLIDE RIGHT OUT!!! IF YOU TRY TO JUST DO THIS PROCEDURE WITH JUST ONE OF YOUR FINGERS ON THE RELEASE TAB AND NOT DO THE SMALL FLAT HEAD SCREW DRIVER PROCEDURE, THE DISCONNECTION WILL NOT, I REPEAT, WILL NOT COME EASILY. Last edited by 2005 300 LIMITED; 10-17-2018 at 06:42 AM.